This is a slightly revised and updated list of tips from the one I published here last week with 17 tips. The day after that I also wrote one called My dementia Trumpet call, explaining a little why I’d put together a list in the first place. Of course, there was some angst from a couple of people about some of my points, but overall, mostly consensus, especially by people living with dementia. If it is possible to positively impact the life of even one more person living with dementia, then it would not matter how many people without dementia had disagreed with me. I presented this new list to two groups yesterday, one a group of professionals at a Diversity Forum in Ararat yesterday morning, and then to a group of mainly family carers and people with dementia at a YOD support group last night, as well as a few staff working in the area. Everyone I spoke with about the list agreed with, and many asked if they could print it off, including some of the staff working there and in aged care in Ballarat. So, here it is, as a jPeg to make it easier for you! 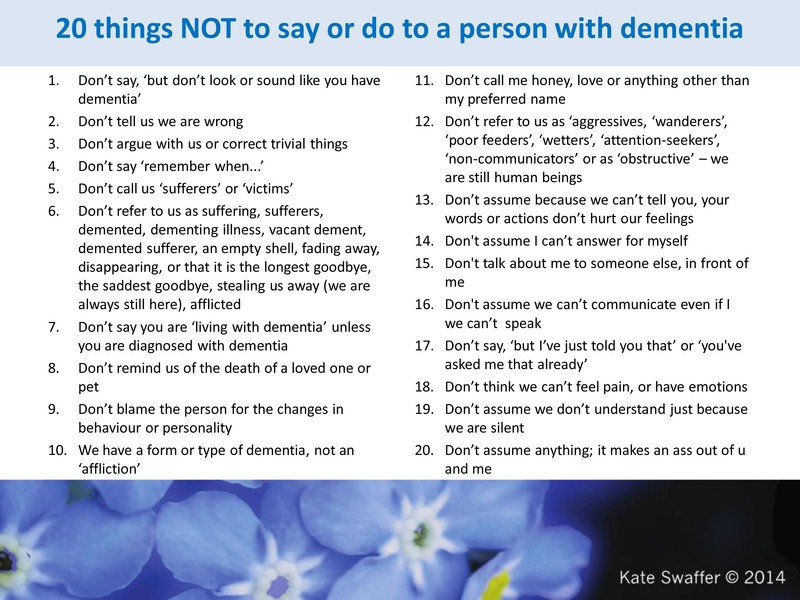 I have also attached an already UPDATED and revised PDF here with a new term not to use suggested by Leah (thank you Leah) 20 things not to say or do to a person with dementia_Kate Swaffer_ June2014 and I will update the jPeg that was below soon, with the help of my BUB! If a person ask to see their parents and they are dead should you tell them they are dead ? Hi Gary, not completely able to answer that without knowing them or being there… I’m guessing watching some Teepa Snow videos may assist you more than me. I suspect though, if they think their own parents are still alive, perhaps distraction is possibly appropriate. This is a great post Kate. It’s so imperative to empathise with other people – treat others as you’d want to be treated. Many thanks for putting this list together – will keep for myself as a reminder and will also share. Your insights Kate remind me of why I work with People living with dementia and continue to study in this field. Working in an RACF is so frustrating as we are still hitting our heads up against the wall on “staff centered care.” I shall battle on as long as I can. Another Point that requires inclusion,the last rites. The last thing that goes is hearing and can you imagine the terror in a non responsive patient to know they are dying. Thanks! One day I’ll finish my book about it, elaborating on this list in detail. Thats great Kate-i look forward to reading your book and ill by it soon!Good on you for writing another book!Will print it off and it give it to my Aunty and Grandma to hopefully learn some things too! Hi Kate, I think this is so helpful for people. Would you mind if I shared this jpeg on a (new) curated website with full credit to you and a link back to this page? Thanks for sharing my work… your article reads like a ‘rewrite’ of mine. Better to get the message out there, than worry about plagiarism, which I have started to see as a compliment, rather than be annoyed. Just be because someone had a bad childhood or has other “mental disorders” such as Anxiety or Depression doesn’t mean that they can’t also have Dementia. It isn’t an either/or situation. Some doctors believe if a person had a bad childhood that then all their complex physical symptoms are psychologically caused. I have Young Onset Dementia and I agree with 99% of these. The only thing I don’t mind is being called love or honey etc as long as it is affectionate motivated and not being patronising. Sorry to read you have joined our ‘club’… let me now if there is any way I can support you. Maybe, Kate, you could create another list for people newly coming in contact with those having dementia, as it is such a foreign concept. So there is a double edged sword with people getting offended with comments being made. For those new to dementia, they are expressing a view from their paradigm. It shows that our starting base is still “below ground zero”. That is a great idea Jo… and is also why this list is the basis of my third dementia book, to explain why, and what the alternatives are, if I ever get to finish it!! The list is great Kate and I will look forward to the book. Thank you for all you do. Coming from someone living with Dementia is Very Educative and would make a world of difference as you cannot educate Staff, Siblings and Family enough about their demeaning Approach & Attitude towards People living with Dementia! Tanx for Sharing, Really Great Stuff! Many thanks for this useful list. Have re-blogged and will show to local groups. Can always rely on you to come up with the ‘good stuff’. We all need to read this. Thanks George… my book that will end up being 20 chapters, with why, and what some alternatives are, is in progress as well! Great stuff Kate … I work in a dementia unit in an aged care facility and am going to print this and put it in the staff room! I see you will be speaking at the Terrigal Conference next week. Her G.P. was appalled. I was shocked . She was admitted with suspected pneumonia not Ebola or the Black Death. Just after posting today’s story, ‘Whose Truth Is It Anyway?’ on the ctrlalzshift.org site, I came across this list from Kate Swaffer’s, which is perfect follow-up reading. Thanks, Kate, for helping me to understand better. I’ll be sharing. Hi Kate, I happened to stumble across your blog back in December last year. My grandfather dealt with dementia before he passed away 9 years ago. Now my grandmother has it and she is in full time nursing home care. I am thinking that my parents may want to have a look at this list because for a long time from around December 2011 to December 2013 my parents were the only people who were going around to my grandmother’s house to check on her sometimes 8 times a day and in that time she refused to go to a nursing home for respite as she preferred to stay in her own home. This is my dad’s mother I refer to btw and my aunt whenever my grandmother would forget things, would just tell her that she’s just forgotten. Something I myself would find very harmful to say but I’m often not allowed to say this. My grandmother had always been one for turning things off after using them. as a family we were told by proffessionals that there was a risk she may leave the gas on and burn down her house and the family had to go to court and the judgement was that the gas had to be turned off at the stove and there wasn’t allowed to be a fan heater in the house for fear of it being knocked over and causing a house fire and this is even though the heater would shut itself off if knocked over but I do think this list may be worth my parents having a look at when I find it. BTW, I don’t mean to be rude but do you yourself have dementia or are you just an advocate for it? apologies I do have to really watch what I do say. Kyle. Thanks for sharing your personal story here… and I have younger onset dementia, and have been writing almost daily for about three and a half years. Often people are afraid of speaking to someone with Dementia because they don’t know how – they think he/she needs to be treated differently. That’s not the case. These 20 things not to say will help put your fears at ease. What a good idea robynverrall. All professionals, inclusive the medical, should keep learning!!! Thanks for your work. I’ve begun following you. Thanks Susan… I sometimes write in the first person, but not always. totally agree with you Carol… and lovie or dearie gets me reasonably riled too! Hi Kate, Thank you so much for sharing your thoughts with us. I have siblings who are having trouble accepting mum’s Alzhiemers. Your list will show them what is actually going on with mum. I think the ‘attention seeking’ should also be added. You are in inspiration. Hi, thank you for such interesting information, this has been a tremendous eye-opener in adding to the comfort of those going through this illness. REWARDING!! AWESOME!!! Thank you Kate, I would be delighted if you would allow me to share this with my fellow carers at the nursing home where I work. We have a dementia specific unit and I think they would learn from it. Kate, this list is just so “perfect”. As full-time carer to my Mum who had Alzheimer’s Disease many of these points often floated around in my head and I did “advise” family members / friends of some of them (as Mum’s advocate). If I had made a list for Mum it would have been very much the same as yours. Thanks for this wonderful insight. As a spouse of someone in the early stages, I found this amazingly useful. Thanks Alice, and I hope you find many things helpful here and elsewhere. My pleasure… hope it has been helpful. I have been the caregiver for my mom and dad (he has Alzheimer’s) for the last four years while trying to juggle work, teenagers at home, grandchildren nearby, and life in general. The hardest part has not been my dad’s dementia, but my mom’s grief and lack of acceptance. Your twenty tips give me hope that she might finally understand what I have tried to model for her and tell .her. Thank you!! ahaa, Yes, attention seeking – as if it’s a crime! It is such an awaful term to use for someone struggling to communicate due to the symptoms of dementia, actually very mean! Love the updated version with the additions. I hope I assisted with one of them and if I may there is another phrase I despise which you could possibly add to point 13 and that is “attention seeking”. Hi Leah… I can’t remember as received so many comments, but maybe! I’d love to add ‘attention seeking’ to the list in tip- 13, which I realise needs editing anyway… arrrggghhhhhh!!! just when you thnk you have it ‘just right’ too!